(March 7, 2003) -- With his family gathered around him, Henri Richard celebrated his birthday this year. But something was odd - there were only seventeen candles on his birthday cake. It all adds up when you realize this champion of champions was born February 29, 1936. Henri Richard seemingly beat the sands of time by being born a Leap Year baby. Born in Montreal, the younger brother of Canadiens' star 'Rocket' Richard, Henri was either blessed or saddled with the burden of playing in both the shadow of the Montreal Forum and in the shadow of one of the greatest players in the history of the National Hockey League. "All I ever had in my mind was playing with the Montreal Canadiens and thinking about playing with my brother Maurice," recalls Henri as he reflects back on the early days of his hockey career. Although there was a fifteen-year difference in their ages, Henri Richard couldn't help but be influenced by his oldest brother, the Rocket. "I wanted to play hockey because Maurice was playing hockey. But I never said it to anybody. When I was in school, they used to ask me what I wanted to do when I grew up. I never said, 'A hockey player.' I always said, 'A plumber' or something like that," laughs Henri. But although they shared the same genes, Maurice and Henri were entirely different types of hockey players. Maurice was solidly built and fierce in his determination to do anything conceivable to score. Henri, on the other hand, was slight in his build, and was renowned for his excellent stickhandling and playmaking abilities. 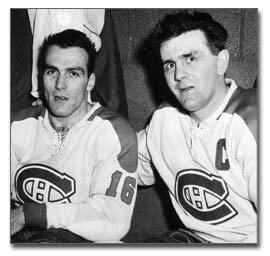 In fact, while playing with the Montreal Junior Canadiens in 1953-54 and 1954-55, Henri led the Quebec Junior Hockey League in scoring both years. "A lot of people said I wouldn't make it in the NHL," chuckles Richard. At 5'7" and 160 pounds, Henri proved his detractors wrong. He showed great durability and used his speed and stickhandling to compensate for what he may have lacked in size. "Elmer Lach was my coach in junior and he told me, 'You'll never make the NHL.' Well, I made it ahead of quite a few good hockey players," shrugs the Pocket Rocket. Henri Richard was a tireless skater. Smooth and fast, the Pocket Rocket employed his superior skating ability to beat opposing teams. "I met my wife when I was six or seven years old. I used to skate with her. She might have helped my skating," smiles Henri. 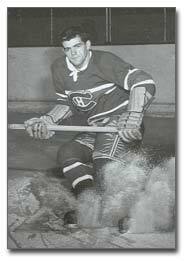 He joined the parent Montreal Canadiens at the beginning of the 1955-56 season. "Because of the age difference, I didn't think it would be possible but I played with my brother for five years (1955-1960). Maurice used to say that if I hadn't been there, he wouldn't have played that long." Yet, while the siblings shared the same dressing room and the same parents, that was the extent of things the two men shared. "We never talked about the game together. If I made a few mistakes while I was playing with him, he never complained. He never said anything. He never said, 'You should have done this or you should have done that.' There were a lot of people who told me that playing with Maurice was going to add a lot of pressure but I never felt any pressure. I never thought about my brother Maurice being a big star. It was normal for me. 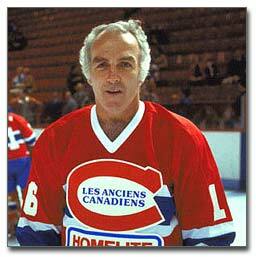 I was only 19 when I came up (to the Canadiens), and Montreal had a lot of great players; it wasn't just Maurice. Beliveau was there. Boom Boom Geoffrion and Doug Harvey were there. Jacques Plante was in the net. It was always a great thrill." In 1958, a third Richard brother came close to cracking the lineup with the Montreal Canadiens. Claude Richard had been a terrific goal scorer with the junior Ottawa-Hull Canadiens team that featured future Canadiens Bobby Rousseau, Ralph Backstrom, Gilles Tremblay and J.C. Tremblay. "Claude had pretty well everything you need to play in the NHL except he wasn't a good skater. He had a good shot. Then, there were only six teams. If it had been the seventies, he might have made the NHL," shrugs Henri. When Henri joined the Montreal Canadiens in 1955, no one could possibly have known that not only was he going to win the Stanley Cup as a rookie, but that he was stepping into a lineup that would win five consecutive Stanley Cup championships and is regarded as one of the greatest dynasties in NHL history. "Some people say it was destiny, but I just think I was in the right place at the right time," admits Richard. "That was a great team. There were so many great hockey players. I wouldn't have said it before, but now that it's all over, I thought winning like that was normal." For five seasons, the Montreal Canadiens juggernaut rolled over the rest of the NHL, led by nine players and a coach who would go on to be honoured with selection to the Hockey Hall of Fame. Coach Toe Blake was joined in the Hockey Hall of Fame by Maurice Richard, Jean Beliveau, Dickie Moore, Bernard Geoffrion, Bert Olmstead, Doug Harvey, Tom Johnson, Jacques Plante and Henri, who was elected in 1979. Through twenty superlative NHL seasons, Henri Richard proved his worth to the Montreal Canadiens' franchise time and time again. 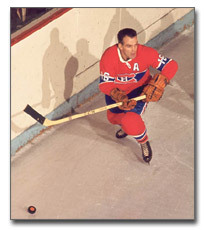 Twice, he led the NHL in assists, and Henri bettered the 50-point mark on fourteen occasions. He was a First All-Star selection in 1958 and was named to the Second All-Star Team in 1959, 1961 and 1963. Following the retirement of Jean Beliveau in 1971, Henri was named captain of the Montreal Canadiens and hoisted the Stanley Cup on behalf of his teammates in 1973. Through 1,256 games, all played in le bleu, blanc et rouge of the only team with which Henri ever wanted to play, he scored 358 goals, 688 assists and collected 1,046 points. But even more remarkable is a record owned by Henri Richard that is unlikely ever to be broken. The skilled centre played on 11 Stanley Cup-winning teams, more than anyone else in NHL history. "Again, I'd tell you that I was in the right place at the right time," states the modest Richard. "A hockey team needs great defensemen to win, and that's what we had all the twenty years I was there. After Harvey and Johnson, we had (Serge) Savard, (Guy) Lapointe and (Larry) Robinson." After retiring, Henri operated a tavern in Montreal, but sold the bar in 1985. Today, he is an ambassador for the Montreal Canadiens, making public appearances on behalf of the team with which he starred. Although he no longer plays alumni hockey, Henri keeps fit by playing tennis and golf. In spite of the shadow cast by an iconic brother, Henri Richard carved out an extraordinary career of his own, and rightfully takes his spot in the legendary Hockey Hall of Fame.